Our hand-crafted picnic tables are Australian Made and built to last in all conditions. Great for the back / front yard, sporting clubs, schools or business seating / lunch area, caravan parks or pubs and cafes. Made from your choice of treated pine or hardwood. Umbrella holes available upon request. Table Tops are all 800mm wide with 190mm wide top panels. Table Top is 500mm wide. DIY table kits are now available. These kits come complete with everything you need to build your new table. (a drill will be required). We ship Australia wide please provide us with your Suburb and Postcode to receive a quote. as we make all our own tables, Flat packs are the same price a fully built table. * Timber colour may vary slightly from our photos. All tables are treated with non-arsenic treatment. ^ 90mm wide top panels are available for an additional $35.00. ^ Table comes without umbrella hole these can be added at no extra cost. Wood is an organic substance. It also tries its hardest to match it’s environment which you may not know. It moves, swells, and shrinks to do so and is normal timber behavior. This should be fully understood and expected when buying any timber product for your garden. Sometimes these cracks can open up alarmingly large but remember it is entirely normal and once the inner core has dried the crack will close up. Likewise as the moisture in the air increases so will the free water absorbed by capillary action in the wood and once again the cracks will close up. None of these splits or cracks in the timber will affect it’s structural integrity or inherent strength. Weatherproof Varnish- Is a clear oil protector which will be applied to your table maintaining the natural colour and grain of the timber. Staining- A stain also provide protection to your table, maintain the natural grain of the timber whilst taking on the colour of the stain. Painting- Painting also protects the wood, however changes the appearance of the natural grain. This is a nice option if you have a particular colour you want to match. Please request what colour you would like. We off all of these services above for an additional $180 per table. Give your table a different look and help it last even longer! A clear oil will provide long lasting protection against the elements whilst still maintaining the natural light colour and grain of the timber. 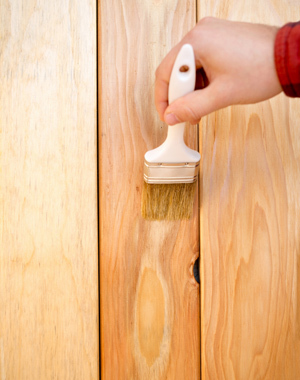 A stain will also provide protection and maintain the natural grain of the timber while taking on the colour of the stain. Just like a house, painting will provide lasting protection and you can match your structure to suit your own property. Delivery of Picnic Tables can be arranged at an extra cost to the buyer. Pick up can be made from Bayswater Vic 3155 or North Geelong VIC 3215 (by appointment only). Contact Jason for details. Please fill out our enquiry form to have a quote sent to you.